One piece of clothing I wear all year round is a blazer. It’s such a versatile piece that looks great no matter what the occasion may be or what season it is. I’m showing you three easy ways to style a blazer this Summer. These looks are easy to achieve and I bet you already have some of the styling pieces in your closet! Take a blazer from work to the weekend and even into the night. It may be a Sunday brunch, a day of running around, or casual Friday at work. A blazer is a great piece to throw on top of jeans and a t-shirt. A blazer helps make the super casual look feel like you are kind of trying. To balance out the shape of a boyfriend blazer, stick to a pair of skinny jeans to slim your shape. The volume of the top will even out with the bottom. For accessories, throw on your favorite cross body bag so your hands free all day and your summer shades. For shoes, I love a pair of good peep toe booties. They are a type of shoe that are easy to walk in but still look cute. A blazer is a classic fashion item that will never go out of style. So how do you modernize it? Mix it up with some trendy items. The asymmetrical ruffle skirt is a key style piece this season. This midi ruffle skirt flatters so many types and there are so many great options out there. The flirty ruffles are a nice way to balance out the masculine blazer. Pair the two with a simple t-shirt- tuck it in or tie it in a knot to bring attention to the waist. 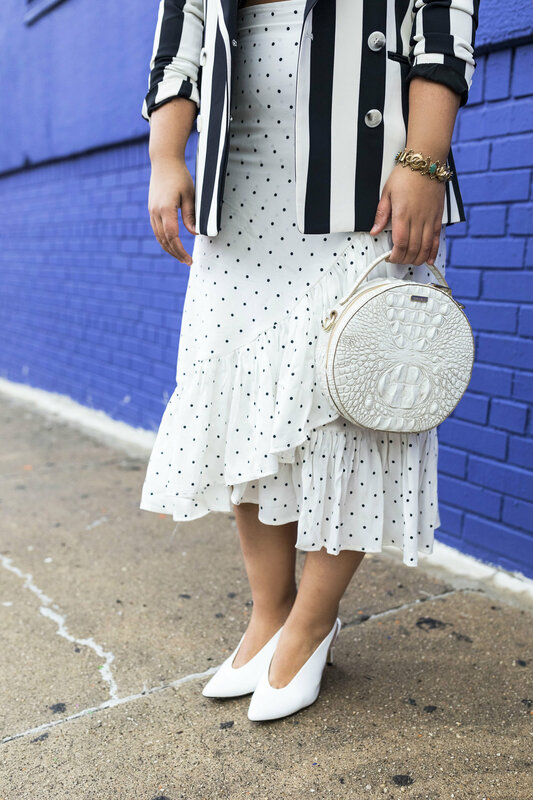 For accessories, I stuck with trendy items like a circle bag and white pumps. A blazer is an essential clothing item in an office. However, styling a blazer in a unique way can really make a difference. A simple way to modernize your blazer is by adding a belt at the waist. Add on a wide or skinny belt to cinch in your waist. Make it a statement by trying out a chain or big buckle belt. Another option is to tie the belt or fold it over to create an interesting knot. Finish off the look with a nice pair of slacks and a white button up (you may already have this in your closet). For accessories, keep it simple with a classic bag. One of my favorite brands I go when I look for classic bags are Kate Spade. This box bag is the perfect option for the office. I think a great way to keep a professional look fun are through interesting shoes. Give mules a try but add a little sparkle through pearls and crystals. I remember thinking in college, "I can't wait to start working!". Now that I've been working in my profession for over a year, I say, "Man, I wish I was still in college". Funny how we always want what we can't have, or take advantage of what we had, when we had it. Don't get me wrong, working definitely has it's perks, but I sure miss the days I could throw on a pair of sweatpants and run out the door. Getting dressed for work can be a challenge sometimes, but I'm going to share some of my tips for making an office look fun! A boyfriend blazer is great for the office or even on the weekend. Being oversized and long makes it comfortable yet fashionable. I love a good pleated skirt too for the office! Depending on the workplace environment, the hem length might differ but this style skirt works with many different other pieces (examples: button down shirt, tank tops, silky blouses, crop tops, etc.). To make the look not so corporate, I threw on a white V-neck. A white t-shirt is my answer for so many looks. Last but not least, because it's Fall, booties are always a great option! These JustFab pair are so cute with the contrasting straps and cut out heel!